Tarboo Ridge Coalition (TRC) hosted 37 leaders from communities throughout Jefferson County for breakfast at the Old Alcohol Plant in Port Hadlock on Saturday, March 23. During the 4-hour session, representatives from 12 areas extending from Brinnon to Port Townsend and from the Hood Canal Bridge to Discovery Bay expressed concern about new County ordinances allowing large-scale military training at private, for-profit gun ranges and the impact this will have on the culture of Jefferson County. In late 2018, the Board of County Commissioners opened up over 76% of unincorporated Jefferson County for such developments. TRC has appealed those ordinances to the Washington State Growth Management Hearing Board (GMHB), with a decision expected on July 17. In its appeal to the GMHB, TRC alleged that the County failed to follow the State Environmental Policy Act, bypassed required Planning Commission review, and adopted regulations that are inconsistent with the Jefferson County Comprehensive Plan’s goals and policies. If the appeal is successful, the County will need to correct these errors or return to rules that allow only “Small Scale Tourist & Recreation” ranges at limited locations in the County. 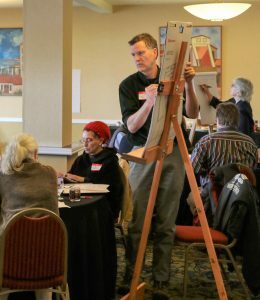 Attendees strategized in small groups and together identified key next steps in resisting this fundamental change to Jefferson County’s land use policy. After the County’s new Shooting Range Safety Ordinance passed, along with revisions to the Land Use Regulations regarding shooting ranges, we heard from friends who said, “Well, that’s over,” or “So glad you won!” Unfortunately, they’re wrong. It’s not over. We haven’t won. Worse, instead of prohibiting military and paramilitary training at private commercial facilities, the new ordinances expressly allow them. The Board of Commissioners and their Attorney have opened up 74% of forestland in unincorporated Jefferson County to new, large-scale, private, paramilitary training centers. Mr. D’Amico has advertised the fact on his Facebook page, offering to partner with individuals who want to join the Jefferson County Gun Range Rush. What is TRC doing, in response? TRC has submitted a complaint to the Washington State Growth Management Hearings Board about the ordinances and the process that led up to them. If the Board agrees that the ordinances are flawed, their decision would invalidate the legislation—in effect, sending both ordinances back for a re-do. Fortunately, neither the Washington State Department of Ecology nor the U.S. Army Corps of Engineers are as passive about enforcing the law. Both agencies sent Mr. D’Amico letters stating their intention to visit the site and evaluate what they consider apparent violations. What is Mr. D’Amico doing, in response? Mr. D’Amico filed two lawsuits after he realized that TRC’s drone flights had documented his illegal activity. One is a restraining order against an individual Board member, and the other against TRC as a whole. Unfortunately for Mr. D’Amico, the drone operator we hired is an experienced, licensed professional who followed FAA regulations and state laws to the letter, to ensure both safety and legality. As Mr. D’Amico’s claims have no basis in fact, we are confident that he will lose both suits. But make no mistake: these are “Strategic Lawsuits Against Public Participation,” known by their acronym SLAPP. This is paper terrorism. Will Jefferson County continue to be our home, a place where we want to raise our families? Or will it be home to large-scale, private, for-profit paramilitary training centers? We are entering a new phase in this fight to create a future for fish, farms, forests, and families. We are moving from an initial effort focused on legislation to a longer-term effort focused on permitting and land-use regulations. As TRC moves forward, you can be confident that we will continue to act with integrity, and that we will not be harassed or intimidated. We will not be SLAPPed into submission. We are not terrified of paper terrorism. We believe the vast majority of residents do not want Jefferson County turning into a haven for paramilitary gun camps. We must insist that our county representatives listen to their constituents. We will soon be staffing information tables around the County to collect signatures on a petition that asks the Board of Commissioners to enforce the law, and investigate the illegal activity occurring at Mr. D’Amico’s paramilitary training site. We hope you’ll stop by to chat and sign on! We also need your financial support, to fund our appeal to the Growth Management Hearings Board and defend our Board members and organization against the SLAPPs, as well as be ready for any future actions that need to take place. One of D’Amico’s aims is to win by exhausting our financial resources and intimidating our board members with lawsuits. We won’t be intimidated and by contributing to our legal defense fund you can help make sure we save our county together. There have been a lot of rumors about what TRC thinks about the Jefferson County Sportsman’s Association. Tarboo Ridge Coalition has never taken a position or commented about JCSA at a public hearing. We respect their long held practice of training recreational shooters. This unambiguous language comes directly from the existing Operating and License Agreement between Jefferson County and JCSA. The current agreement with Jefferson County does not include law enforcement training for other counties nor does it include training for military groups. Training for such groups adds a burden to the JCSA in that it takes away time for members to use the facility as well as creating additional noise above and beyond what is expected for “local” uses. Yes, this is still a roller coaster, but don’t get off now! The newly passed gun range ordinance impacts two aspects of the County code. The regulations that passed last Friday are relevant to Title 8, which is focused on public safety. The other impact is on Title 18, which has to do with land use. Changes to Title 18 require a public hearing before the Planning Commission, which occurs this Wednesday. The Planning Commission is a group of volunteer citizens who want the best for this county. We hope that they will make recommendations to the BOCC about this section of the ordinance, to preserve our current land use code and protect our quality of life. While Mr. Hunsucker, county attorney and author of the new ordinance, discusses a “harmonizing” of the newly passed Title 8 and the current Title 18 sections, at present they are in conflict. The Title 8 ordinance (already passed) states that if any provision in this article conflicts with Title 18 (the subject of Wednesday’s hearing), that Title 8 will prevail. Our job together is to make sure Title 18 prevails. The recently passed Title 8 ordinance that the Planning Commission was shown on October 17 is an expansion of gun range sizes and uses. The draft is tailor-made for operators such as Fort Discovery, Inc., Joe D’Amico’s operation, and does not comport with the purpose and intent of the Moratorium ordinance. The TRC’s primary focus will be preserving, not removing, the existing small-scale recreation and tourist qualification for gun ranges. We oppose any attempt in the County’s draft ordinance to re-designate commercial shooting facilities as something other than small-scale recreational tourist uses. Gun ranges in this county have always been small-scale recreational tourist uses. There is no basis for changing that designation. Recreational shooting will always be welcome in our county; sprawling training facilities will not. We need people at the meeting this Wednesday making public comment to the Planning Commission and writing letters. We believe letters from the heart by residents of the county are most effective. • All new ranges should be indoors. Indoor ranges alleviate many environmental and noise problems, and are being promoted all over the United States as a way to accommodate the needs of both recreational shooters and nearby residents. • Citizen rights to live in peace vs an individual’s right to insert a non-compatible business. • No military training in Jefferson County. Our local law enforcement officers’ training needs are currently being met by the Jefferson County Sportsman’s Club. The Federal Government trains our military, and the military is not allowed to act as a domestic police force. • No outdoor night shooting. • No landing aircraft allowed. • Required environmental testing for copper. What happens to Jefferson County if we have the most permissive gun range code in the area? Do we become the default haven for all shooters in an extended area, while sacrificing our forestry, tourism, and agricultural industries, not to mention our rural way of life? 1. Adoption of a 500-yard buffer zone around lakes. A buffer zone for lakes appears in the Kitsap County ordinance and should appear in ours. The County staff report recommends against adopting this provision on the grounds that it is unnecessary, since the draft ordinance will orient shooting ranges away from lakes; unreasonable, since duck hunters can shoot on lakes; and likely to result in a costly legal challenge and expose the County to liability for property owners’ attorney’s fees under RCW 64.40 and 42 U.S.C. 1983. None of these justifications is correct. The County should adopt the buffer zone. Orientation of shooting ranges alone will not protect lakes, contrary to the staff report. Bullets do not always travel in a straight line; they ricochet. Nor does the presence of duck hunters on lakes justify the presence of shooting ranges next to lakes, since duck hunters fire only occasional blasts of short-range shotgun pellets, whereas shooters at gun ranges fire hundreds or thousands of rounds of long-range rifle bullets, year around. Given the much higher volume of more dangerous projectiles, a Kitsap County-style lake buffer for shooting ranges is necessary and proper. 2. Adoption of a 1,000-foot setback from property line. A setback of 1,000 feet from the property line to the nearest edge of any part of the shooting range. As with the setback for lakes, the main issue here is bullet safety. In addition, a 1,000-foot setback will mitigate (though hardly eliminate) noise impacts from a commercial shooting facility. Setbacks are a common feature of land use regulations, even for relatively innocuous land uses like single-family houses. Imposing a setback on commercial shooting facilities is reasonable to protect the safety of persons on neighboring properties and has the secondary benefit of reducing the uniquely noisy impacts of these facilities. Indeed, Thurston County already has a setback for shooting ranges in its land use code. 3. Commercial shooting facilities are not essential public facilities. An essential public facility (EPF) is one that is necessary to serve the public welfare, such as airports, schools, in-patient facilities, sanitation facilities, and transportation infrastructure such as highways and airports. These facilities are exempt from most zoning laws, because they are “difficult to site” but also provide services necessary for the public welfare. WAC 365-196-550. A commercial shooting facility might be difficult to site, but it is not essential to the public welfare of Jefferson County. There are plenty of gun ranges within reasonable driving distance where County law enforcement officers can train and civilians can shoot for fun. There is no basis for granting any commercial shooting facility EPF status. There is no history in Jefferson County or any other county or city in Washington State of granting EPF status to commercial shooting facilities. Therefore, TRC’s draft ordinance includes a statement that commercial shooting facilities are not EPFs, and thus are not exempt from zoning laws. 4. Do not make any amendments to Table Three in the current Title 18 ordinance. Commercial shooting facilities should remain small-scale recreational tourist uses. The land use code currently provides that all gun ranges must be small-scale recreational tourist uses (JCC 18.15.040, Table 3-1). We believe this is an appropriate designation for commercial shooting facilities. Such facilities should be kept small, aimed at recreational (as opposed to professional) uses, and have a tourism (as opposed to training) focus. Our draft ordinance proposes retaining this long-standing designation. And naturally, small-scale recreational tourist shooting facilities must still comply with the new safety and land-use regulations proposed for shooting facilities. Don’t lose heart. We aren’t! On Friday November 2, the Jefferson County Board of Commissioners approved an ordinance that opens commercial forest in Jefferson County to large-scale, for-profit military and paramilitary training. Because the ordinance contains no restrictions on the scale or types of shooting or tactical training that is allowed, Jefferson County will likely become a magnet for outdoor gun range development. Ranges could be hundreds of acres in size. Helicopters and other aircraft are permitted as is shooting at night. In effect, the County could be trading an economy based on agriculture, forestry and tourism to one focused on commercial operations that host military and paramilitary training. The ordinance was the culmination of a year-long moratorium on siting gun ranges that was approved by the County Commissioners in December of 2017. Even though the ordinance that established the moratorium expressly stated that recent regulations passed by Kitsap County should serve as a model, the new Jefferson County ordinance is much less restrictive. The Jefferson County rules allow gun range development along public lakes and streams. In addition, it permits any type of training desired by military or paramilitary groups. Overnight accommodations are allowed, making long-term, high-intensity training programs permissible. The Tarboo Ridge Coalition (TRC) wanted the ordinance to protect the citizens of Jefferson County, our forest economy and the environment. They advocated for maximizing public safety and minimizing the impact of lead, copper, and noise pollution. The new ordinance fails to address the dangers posed to the public and wildlife by copper pollution. The new ordinance also ignores concerns raised by the Jefferson County Sportsmen’s Association, a 700-member non-profit that had lobbied for measures that would help their facility meet the design changes mandated in the new law. TRC favors indoor gun ranges and opposes outdoor gun ranges that are located near lakes and other public recreation areas, or that are large-scale and designed for military or paramilitary training. Although the Commissioners received hundreds of written comments and heard over 6 hours of testimony, that public input was not reflected in the ordinance. “While the Tarboo Ridge Coalition is very disappointed that the BOCC adopted this flawed ordinance, we are in no way less determined to use every available resource to prevent the establishment of any military/ paramilitary training center on the shores of Tarboo Lake or any place else in Jefferson County,” said Jim Smith, a Tarboo Ridge Coalition member.